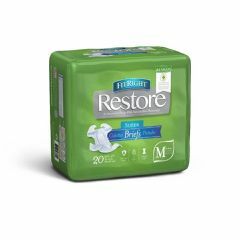 The FitRight Restore Brief addresses the need to keep skin extra dry and the need to maintain skin integrity. A layer of Medline Remedy Skin Repair Cream has been laid into the brief to further help maintain skin integrity. Platinum Series 4D-CoreTM with odor protection helps wick fluid away to lock in moisture and promote dryness. SensiSoft cloth-like backsheet provides the ultimate in soft, garment-like, natural feel. Available in sizes Medium (white), 32- 42" (81-107 cm); Regular (purple), 40-50" (102-127 cm); Large (blue), 48-58" (122-147 cm); X-Large (beige), 57 -66" (145 -168 cm); and 2XL (green), 60-69" (152-175 cm). AllegroMedical.com presents The FitRight Restore Briefs. The FitRight Restore Brief addresses the need to keep skin extra dry and the need to maintain skin integrity. A layer of Medline Remedy Skin Repair Cream has been laid into the brief to further help maintain skin integrity. Platinum Series 4D-CoreTM with odor protection helps wick fluid away to lock in moisture and promote dryness. Soft anti-leak guards help to reduce leakage and improve containment. Skin-safe closures provide secure, safe and repeated refastenability. SensiSoft cloth-like backsheet provides the ultimate in soft, garment-like, natural feel. Breathable side panels increase airflow and maximize patient comfort. Moisture alert wetness indicator changes color when the garment has been soiled. Available in sizes Medium (white), 32- 42" (81-107 cm); Regular (purple), 40-50" (102-127 cm); Large (blue), 48-58" (122-147 cm); X-Large (beige), 57 -66" (145 -168 cm); and 2XL (green), 60-69" (152-175 cm).